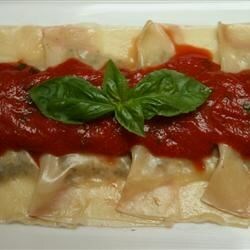 "Ravioli are made using wonton wrappers and stuffed with a luxurious mascarpone and mushroom filling." Heat the olive oil in a large skillet over medium-high heat. Add the shallots; cook and stir until starting to brown. Reduce the heat to medium and add the mushrooms, thyme, garlic and chives; continue to cook until the liquid from the mushrooms has evaporated, 5 to 10 minutes. Remove from the heat and set aside to cool. In a medium bowl, stir together the mascarpone cheese and mushroom mixture. Season to taste with salt and pepper; set aside. Lay out 16 wonton wrappers on a clean surface. Whisk together the egg and milk in a small cup. Brush the egg wash onto the wrappers. Place one tablespoon of the cheese mixture onto the center of each square. Top the cheese with a small spoonful of the mushroom mixture. Place a second wonton wrapper over the top of all the filling and press to seal the edges. You may refrigerate the ravioli on a baking tray covered with plastic wrap. Bring a large pot of lightly salted water to a boil. Add the ravioli one at a time and cook until they float to the top, 3 to 4 minutes. The filling was restaurant quality, and instead of making ravioli, I shaped each won-ton wrapper into tortellini and I didn't lose a single one.